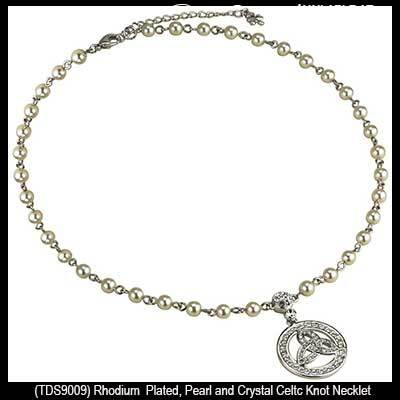 This rhodium plated Celtic necklet is a necklet style design that features the Trinity knot and it is enhanced with pearls and crystals. This Celtic knot necklace features a Trinity knot that is set with crystals and is also surrounded by crystals. The 16" long necklet style chain is set with fresh water pearls and has a 2" long extender chain with a lobster claw catch. The extender chain features a tiny shamrock tassel at the end and the chain bail is also studded with crystals. The silver tone Trinity pendant is plated in rhodium and measures 7/8" in diameter. 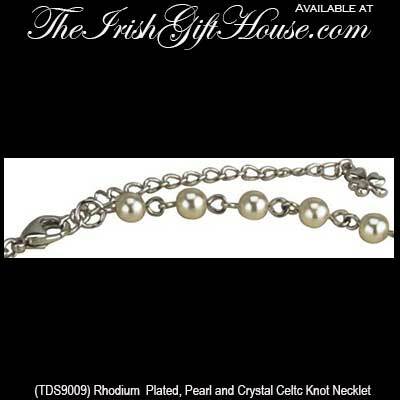 The Trinity necklace is made by Tara Jewelry in Dublin, Ireland and it is gift boxed with Celtic knot and shamrock history cards that are complements of The Irish Gift House.